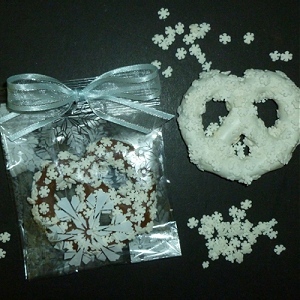 White chocolate dipped pretzel knot decorated with snowflake sprinkles is packaged in a snowflake patterned cello bag, tied with sheer ribbon. Perfect promotional handout during the winter months, these chocolate pretzels makes a nice Christmas party favor for corporate parties and events. Change out the decorative ribbon and customize by imprinting a solid color white ribbon with Silver Foil in a continuous loop imprint for a set up fee of $16 and an additional $.10 per bag.